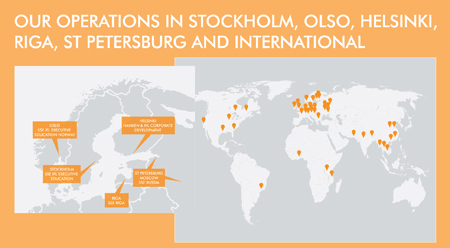 SSE IFL Executive Education is the leading Nordic player in executive education and is represented in Sweden, Norway, Finland, Russia and the Baltic region. It has its base in the Nordic region but is an internationally diverse executive education provider with numerous multi-national clients and globally competitive experience. IFL Executive Education is specialized in integrated General Management programs and focuses on Leadership, Business and Control, and Finance and Insurance. All programs are designed to meet diverse business, managerial and leadership challenges in different types of organizations through Live Learning and blended learning approaches including e-learning. IFL Executive Education bases learning processes on a combination of research and experience-based knowledge and always starts from the customers' practical challenges and dilemmas. This means that the programs give real results-in the short term as well as in the long term. IFL's top place in the Financial Times overall ranking of Nordic players-including a top 10 ranking in Europe among tailored corporate programs-is a hallmark of our success in catering to those needs. ... has an international faculty network of more than 500 individuals. Our programs fall into the following broad categories: Partnership (In-Company) programs, Consortium programs, Open enrollment (public) programs, Executive MBA, Top Executive Offerings, Seminars and Coaching. IFL Kämpasten is a conference and training facility designed to meet the highest demands on learning environments and forums for networking. At Kämpasten, the whole world gets together-Swedish and international guests. The IFL Learning Manifesto represents insights from best practice. More than 20 of SSE IFL's experienced faculty, staff and network have contributed directly to these learning insights, while our extended learning community, participants and alumni have provided a generous "learning lab" for learning evolution and steering / promoting growth. IFL Learning Manifesto - The Essence of Executive Education captures the IFL vision on what executive education should be; a virtual manifesto expertly summarising IFL's view on learning. 15 in-depth interviews with key people demonstrate how to contribute to a sound business climate and public sector through knowledge-creation, learning and development.